If you're awake and near a screen, it's likely you're feeling a sense of urgency. The endless connectivity of our devices can't help but give us an endless feeling of lagging behind. Whether your anxiety is generated by an overflowing workload, bulging schedule, or the ongoing parade of alarming headlines, now is a great time to take a breath. Find your inner quiet, and focus on family acts of compassion right in your own community. Kindness is a powerful antidote to anxiety. And stepping away from the noisy aggravations of screen time is a healthy move for kids and adults alike. 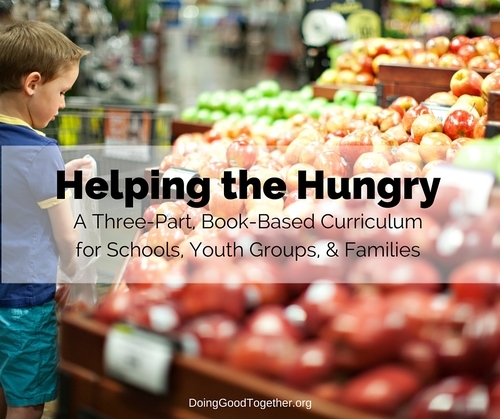 Doing Good Together has followed the research on this for a long time. We know that keeping screens in their place makes you feel better. And we know that when people feel daunted by everyday life, doing good for those in need may be the best first step. Emerging research suggests that volunteering measurably improves our physical and mental well-being. Doing Good Together offers many ways to get involved, feel better, and make a difference as a family. It's all part of what we call a kindness practice. By starting a kindness practice, your family commits to bringing a sense of compassion to simple, everyday habits. Through a family kindness practice, you might employ DGT's conversation starters and extensive book lists to discuss big ideas with respect and curiosity. And of course, a kindness practice inspires your family to share intentional acts of service in your spare time, whether that is five minutes or a week-long service vacation. Give it a try and start your commitment to kindness right now! Here are a few tools to get you started! Click to print the English verison. Click to print the Spanish verison. 1. Put one of these 50+ Family Acts of Kindness on your calendar. This unique printable, available in English and Spanish, makes it easy to schedule a specific time to do good, together. Or browse our projects, each with its own set of conversation starters, book recommendations, and instructions. 2. Create distraction-free family time. If you're feeling stressed, a little screen-free family time is a powerful tool to renew your sense of connection and joy. Banish screens from the dinner table. Do something joyful together, like trying an outside activity, family game night, or creative service project together. Refine your media diet. Be careful to choose – and subscribe to – news sources you trust. Turn to social media with intention (set a specific time) and once there, be social and courteous. 3. Nurture big-hearted daily habits. Our latest newsletter Live Kind: Compassion as a Way of Life couldn't make it easier. This incredible resource offers tips to make the daily routines of family life a little more compassionate. Great literature is a wonderful way to be still together, while providing a creative backdrop for a conversation about big ideas. You may especially enjoy the book lists below, or any of the others from our Read Together Collection. Strive to choose a wide variety of titles, introducing many different issues, themes, and life experiences. Whatever you do, do good. Even in the best of times, the world can feel full of impossible problems. If we let the sheer enormity of them overwhelm us, we can no longer be a part of the solution. If instead, we do what good we can for those around us, we will make an impact. If we share kindness widely, we will make an impact. And if we approach others with curiosity and compassion rather than fear and judgement, we will make an impact. Together, let's each do the something we can do, as author Edward Everett Hale says, and bit by bit our communities and our world will grow a little more big-hearted each day. Browse our collection of big-hearted tools and practice kindness today! Older PostMake Valentine's Day a Season of Kindness!